Tomorrow morning I’ll be checking into Duke University Medical Center for Periacetabular Osteotomy (PAO) surgery. Since the hospital I’m having my operation at is over 3 hours from where I live in Virginia, I’m staying in North Carolina tonight. As I’m sitting here, in my hotel room, the nervousness is really starting to kick in! (I’ve never been put under anesthesia before) Between the holidays and grabbing last minute stuff I needed before surgery, I’ve been so busy that I haven’t had a lot of time to freak out. Thankfully, my mom is flying in tonight to be with me through my hospital stay. I know it will be comforting to have her here. After I scheduled my PAO, I started doing a TON of research, which led me to an awesome Facebook group filled with thousands of individuals who have had or are going to have the same surgery. Everyone is very supportive of one another and they all have great advice. I feel so lucky to have found them. 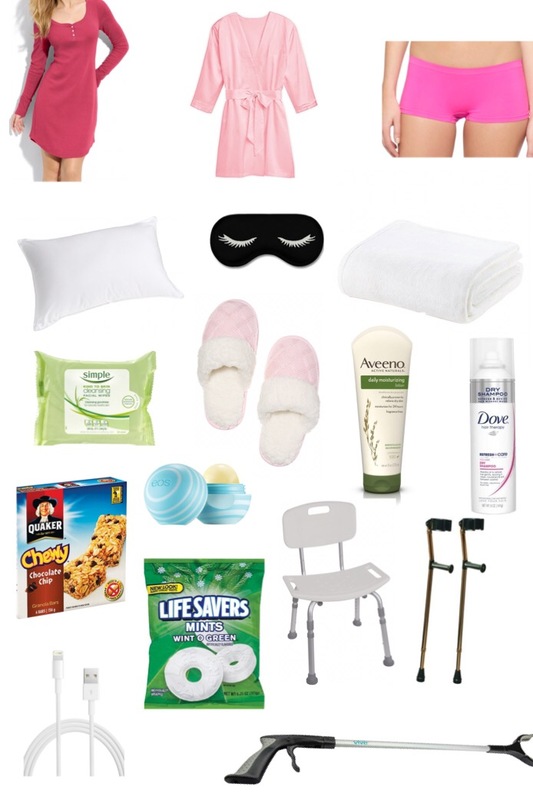 After talking to several different people, I was able to make a list of hospital and at home essentials. Thanks so much to my family and friends who are keeping me in their thoughts and prayers! It means the world to me. I’ll try to post how everything goes as soon as possible. Keep thinking positive, we’re praying for you. Please post an address where you can receive mail. You’ve got this! Hugs!